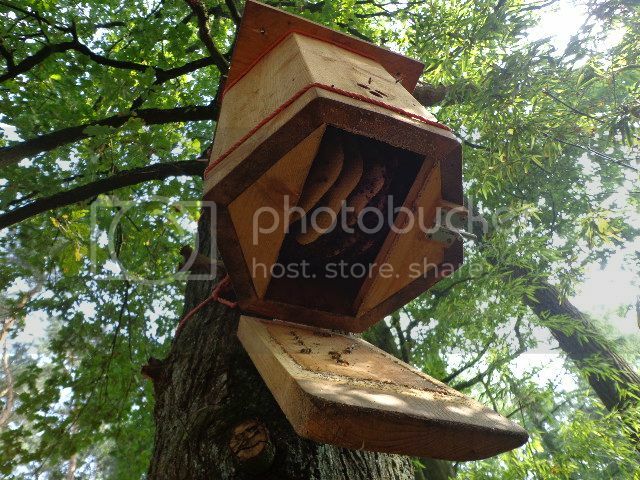 I make some kind of imitation tree cavities, and name them "nestbox 4 bees". I had succes with one of them, receiving a swarm. No one knows when the swarm arrived but it must have been a while ago, the box is quite full ! What? No removable frames? Ten foot up a tree? Doesn't look very inspectable to me BioBee. The men from the ministry won't like that and so we won't be having any of those over here in the UK than you very much. Just joking, for the benefit of our European friends who might not get my puerile English sarcasm. 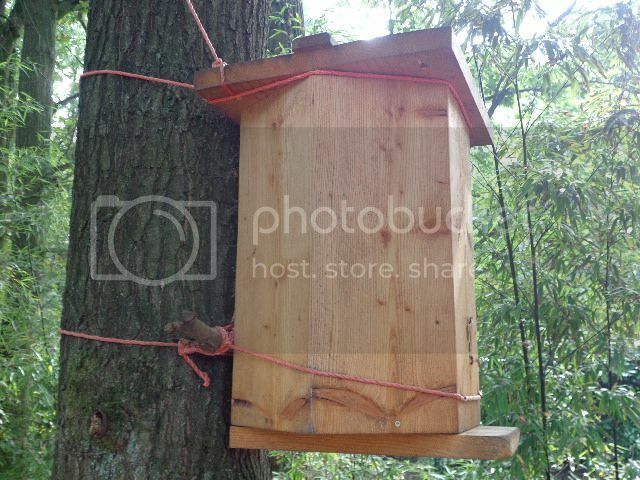 Cool looking nest box. Nice work. Excellent! Nice work.I really like that! Firstly, did you decide on a specific volume for the box? Some people think Thomas Seeley's 40 litres is an optimum size (I met someone with a similar nest box recently but had not come up with a tree friendly attachment plan)... and secondly will you keep us informed of how this and the others you have up do over time. 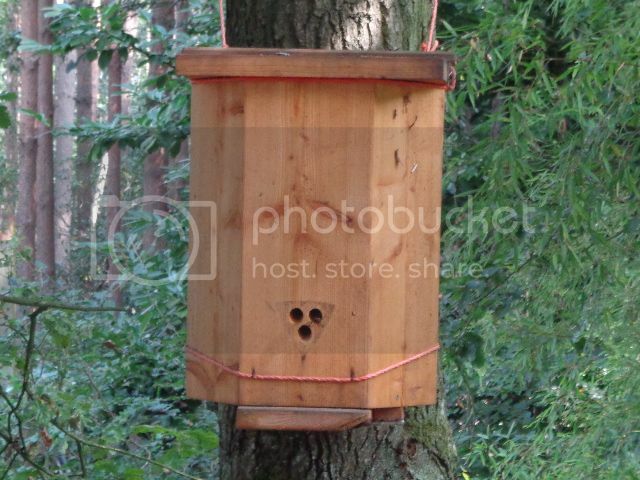 Indeed, I have nestboxes like this that even don't have a snoop-door at the bottom. They fit in my plan to crowd the area with as-natural-as-possible bees. 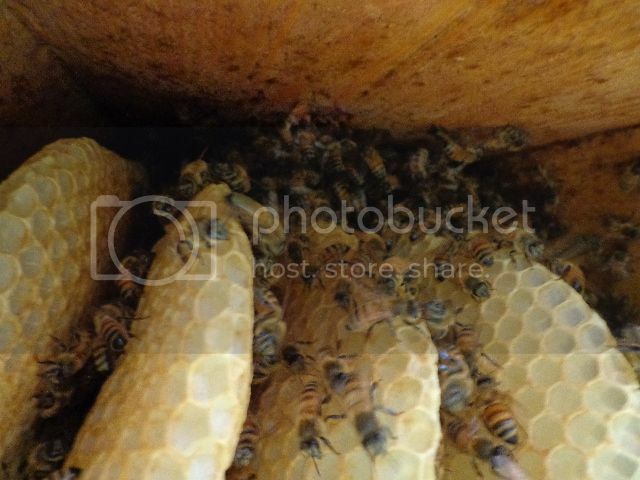 I aim to have half of the colonies in nestboxes, the other half in warré hives. Firstly, did you decide on a specific volume for the box? The volume is about 44 liter. So, how is the colony doing? In the pictures it seems they ran out of stores, since they stopped drawing comb in the midst of the box. You see the sharp edges of the lower part of the comb. If they had enough food, they'd finish that box and would have rounden the bottom of the comb. Is the colony still alive? Bernhard is right: the combs were not finished at the end of august, when I took the photos. But the middle (where they are the longest) was reaching down until about 4 cm. from the bottom, not until the middle of the box. Maybe that's not so clear because of the angle the pictures were taken? the bottom of those combs would be flat if they'd be finished. And would reach right down to the bottom. So something made them stop. And most likely that is a missing nectar crop. Just guessing but to me such a sight from the bottom makes me worrying! I worry a lot, though. I've been thinking about a way to emergency feed this colony if needs be. (To prepare in advance for anything.) Because it's (sort of) wintering now, a bottom feeder with sugar syrup or honey wouldn't work I guess. 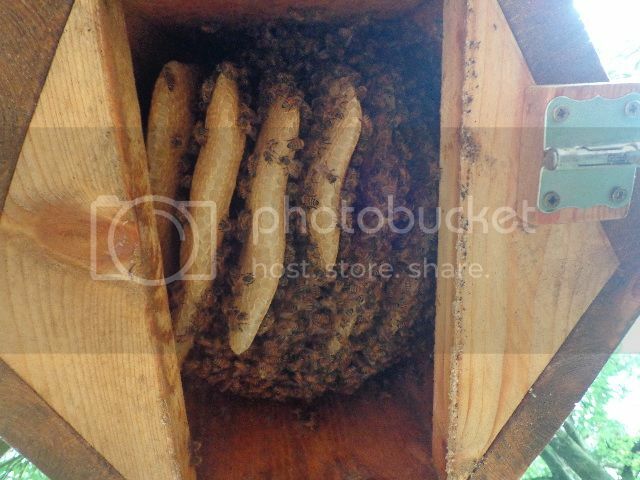 The "hive" can not be opened from the top. I could stick a pack of sugar patty in through the bottom. Maybe on warm days bees can go down from the cluster and reach it? Any other possibilities? I'm happy to say that the colony in the nestbox4bees survived the winter. If we call this last months winter and if it's finished that is.